Maurizio Sarri has endured a turbulent start to his Chelsea reign, made all the more complex by transfer suspensions and keeper-gate in cup finals. Fans have been subject to some scintillating performances followed by tepid displays of sideways football as well. The jury’s out on Sarri, and many are wondering whether he’ll even have the time or the resources to create the euphoric-style football he brought to Napoli in previous years. It’s very easy for fans to see the negatives in the here-and-now and forget the end goal, forget what it is the club is building towards, which is a very different future than the century of success Chelsea have enjoyed. 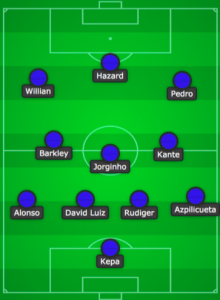 No one can comprehend why the greatest holding midfielder in the world is playing a box-to-box role, why Eden Hazard is often deployed in the false-nine position, and why Jorginho is so stubbornly used in the same way despite clubs nulling his impact time and time again. However, history suggests that there’s a method to the madness. This is the break down of Sarri’s vision. First of all, it’s important to understand what he’s achieved up till now. Only his history with Napoli can give anyone a real indication of what his Chelsea side could look like once everything comes to fruition. So, what did he achieve between 2015-2018? Under Sarri, Napoli scored a total of 251 league goals – more than Juventus’ 238 tally – and achieved the top three on every occasion, twice finishing runners up and coming within points of the league leaders in his second and third season. Sarri built a team that went toe-to-toe with a side that achieved two Champions League finals and had breezed to Serie A success since 2012. Until the arrival of Sarri, apart from one strong season from Roma as well, Juventus went unmatched. To put into context just how much Napoli squeezed out of that Juventus team in pursuit of the Scudetto, Napoli’s points tally of 91 in 2018 would have won them the title in 2008, 2009, 2010, 2011, 2012, 2013 and 2015. In fact, his second-best tally of 86 points, which finished him 3rd, would have achieved first place in 2008, 2009, 2010, 2011 and 2012 as well, achieving a better points tally than Jose Mourinho’s treble-winning Inter Milan side. Sarri took over a side that had finished 5th before his arrival, with a total of 63 points, a whole 24 points behind leaders Juventus. In his first season, Sarri achieved a 19-point better total than the previous regime, finishing 2nd to a rampant Juventus who achieved another 90+ tally themselves. The Italian manager, who’d coached 17 other sides since 1990, was showing his class, experience and attention to detail as he continued to carve out results and better his side in pursuit of the arguably the most dominant side in the history of Italian football. Could Sarri’s Napoli perhaps be the greatest side never to win lo scudetto? There’s certainly an argument for it. This all puts into context not only how impressive a job Sarri did in Naples, but also how much Juventus have had to improve to fend off the challenge of other clubs and maintain their dominance. Any suggestion that Juventus stroll to the title every season is a myth, and balancing this with impressive European campaigns is a great credit to the club as well. SarriBall had an obvious impact in Italy, and over three seasons few clubs managed to really nullify Napoli’s attacking trio who’s fluidity stemmed from the control and intelligence of Jorginho in the heart of midfield. In Sarri’s final season, the flexibility of the front three and the dynamism either side of Jorginho’s dictation, was almost choir-like as the conductor steered the way for the flair and sharpness to come through. The role of the back four is nothing we haven’t seen before in modern football. 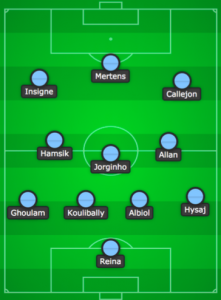 Typically the full- backs almost played as wing-backs, providing the width as Jose Callejon and Lorenzo Insige drove inside to support Dries Mertens, creating overloads against defenders, ready to execute one-twos and even pick up the ball in ‘number 10’ areas. The fluidity of the midfield became very hard for oppositions to stop as Napoli would almost play with eight midfield options, with each player using their intelligence and understanding of the system to know when to sprint in behind defences and offer that piercing attack as a more direct option. What Sarri has done differently to most managers is his use of the three midfielders. Typically, a holding midfielder will have more dynamic and physical qualities, though these days that player is also expected to have a strong passing range to begin counter attacks and dictate play. Whilst Jorginho perhaps doesn’t boast the physical attributes, his passing range is certainly up there with the best in the game. Jorginho’s role in the centre of the pitch is to act as an ‘advanced sweeper’. Admittedly, this term doesn’t exist in football, though it suggests exactly what he’s expected to do, and this can be explained by looking at the other two midfield partners either side of him. Allan was deployed in a box-to-box role, though his attributes are typically more suited to that of a holding midfielder (remind you of anyone?). However, Allan was instructed to win the ball high up the pitch and was given the freedom to use his tenacity and instinctive hunger to win the ball in the areas he saw fit to do so, covered by Jorginho sitting deeper in order to sweep up the ball after the initial press and reignite new attacks. Marek Hamsik provided the midfield flair with his skill and drive but possessed a tenacity that allowed him to sit in the midfield three and mean Sarri did not have to compromise on the teams’ defensive duties. So, how is he applying this to Chelsea? There are key similarities between the way Sarri’s Napoli and Sarri’s Chelsea set up to play. Due to the nature of the Premier League and Chelsea’s expectations as a club, Sarri’s style is coming into question before it’s truly had a chance to establish itself. After a really impressive start to the season, which saw Chelsea beat Arsenal and outplay Liverpool before suffering an added-time equaliser, Chelsea began to hit a period of bad form which saw them lose ground in the title race and join the top four battle. A 2-0 win over Manchester City in December reignited hope, but not a title-challenge. him to Manchester City. For Jorginho to thrive as he did at Napoli, the partners either side of him in midfield have to do their jobs – this is imperative to everything SarriBall stands for. N’Golo Kante’s role in midfield has been criticised by pundits, experts and fans. Though he’s being used in the same way Allan was in previous seasons in Italy – as a box-to-box midfielder who wins possession high up the pitch, encouraging attacks and counter-attacks to restart with Jorginho in the opposition half. The idea being that Jorginho’s accuracy and range of passing would get Chelsea into dangerous areas far more quickly. Ross Barkley and Mateo Kovacic have alternated on the left of the midfield three, fulfilling the role of the ‘flair midfielder’ that Marek Hamsik brought to Napoli. The Chelsea players have somewhat embraced Sarri’s vision, with the side on course to register more passes, more passes per game, a better passing accuracy and more chances created in a whole season than in Conte’s previous two, one of which won Chelsea the league title. However, the fluidity hasn’t always been there, with the side often criticised of being slow, passive and boring. Regardless of that, it’s the improvements in these key areas that Sarri needs for his philosophy to work, and these changes are certainly taking place. There remain some obvious hurdles for Sarri to cross if this team are to fully adopt and embrace his footballing philosophy. Assuming he’s given the time to implement his vision, Sarri needs a squad who will accept that his methods take time to fully understand and execute the way it’s intended to. Pep Guardiola and Jurgen Klopp took a couple of years before their visions fully took shape, and the Premier League can be far less forgiving than other leagues when it comes to having the patience that a footballing philosophy will eventually begin to click. This process simply can’t be rushed. blessing in disguise as Chelsea are forced to turn to their plethora of young talent to improve the squad, giving the likes of Ruben Loftus-Cheek, Ethan Ampadu and Tammy Abraham the chance to impress. There’s no doubt that Sarri’s stubbornness may prove to be his downfall. Ultimately even Jurgen Klopp had to adapt his philosophy slightly in order to sustain a title challenge with Manchester City. As long as the Chelsea player-power of old doesn’t disrupt proceedings, everyone at Chelsea may even land on the same page, and we could see the rebuilding of a serial-winning side that could once again go and challenge for major honours, but this time with a very different identity and approach than any we’ve seen before from this club. Chelsea under Sarri has shown glimpses of SarriBall, but given time, and embraced fully by all around it, Chelsea could be a real force in the next year to two under the Italian’s supervision.